Joseph Bates, a private in M Company who participated in the valley and hilltop fights, died on September 13, 1893, in Sturgis, South Dakota, and was buried there in St. Aloysius Cemetery. Black Calf, an Indian scout also known as Boy Chief, was with Reno’s Column. He died on June 4, 1922, in Armstrong, North Dakota. James P. Boyle, a private in G Company who participated in the valley and hilltop fights and was wounded in the back, died on September 2, 1920, in Bismarck, North Dakota. He was buried on September 14, 1920, in St. Mary’s Cemetery, in Bismarck (Lot 8, Row 8, Block A). Carl August Bruns, a private in E Company who was on detached service at the time of the battle, died on January 4, 1910, in Mandan, North Dakota. John W. Burkman, also known as Old Neutriment, committed suicide on November 6, 1925, in Billings, Montana. Michael C. Caddle, a sergeant in I Company who was on detached service at the time of the battle, died on May 1, 1919, in Bismarck, North Dakota. Charles A. Campbell, a Private with Company B who was with the pack train and in the hilltop fight, died on August 2, 1906, in Bismarck, North Dakota. John C. Creighton, also known as Charles Chesterwood, resided at 107 Seventh Avenue, Mandan, North Dakota, in 1927. William Cross, a scout, died in July 1894 in Culbertson, Montana. Curly, an Indian scout, died on May 21, 1923, at the Crow Agency. William A. Curtiss, a sergeant with F Company, died on October 27, 1888, in Helena, Montana Territory. John F. Donohue died on December 3, 1924, in Butte, Montana. Peter Eixenberger, one of the musicians who stayed aboard the Far West, died on September 12, 1917, in Sykes, Montana, and is buried at St. Aloysius Cemetery in Sturgis, South Dakota. James Flanagan, a sergeant in D Company who was in the hilltop fight, died on April 21, 1921, in Mandan, North Dakota. Moses E. Flint, a packer with the Quartermaster staff, was with the pack train and in the hilltop fight. He died in 1902, presumably in South Dakota, and was buried at Spring Valley Cemetery in Pollock, South Dakota. Harvey A. Fox, who was not at the battle, died on March 28, 1913, in Warm Springs, Montana. Peter Gannon, who was not at the battle, died on June 12, 1886, at Fort Assinniboine, Montana Territory, where he was originally buried. He was reinterred on March 27, 1905, at the Custer Battlefield National Cemetery, Montana, in Section B, Site 1285. Edward Garlick, First Sergeant in G Company, was on furlough at the time of the battle. He died on January 25, 1931, in Sturgis, South Dakota. Goes Ahead, an Indian scout, died on May 31, 1919, at the Crow Agency and is buried in Custer Battlefield National Cemetery. Hairy Moccasin died on October 9, 1922, in Lodge Grass, Montana, and was buried on October 11, 1922, in Saint Ann’s Cemetery in Lodge Grass, Montana. Half Yellow Face died in 1879 at Fort Custer, Montana Territory. John E. Hammon, a corporal in G Company who participated in the valley and hilltop fights, died on January 19, 1909, in Sturgis, South Dakota. He was buried in Bear Butte Cemetery, in Sturgis, South Dakota. George B. Herendeen died on June 17, 1918, in Harlem, Montana. Max Hoehn, a private in L Company who was on detached service at the time of the battle, died on January 6, 1911, in Sturgis, South Dakota. He was buried at St. Aloysius Cemetery in Sturgis. Jacob Horner, a private in K Company who was on detached service at the time of the battle, died on September 21, 1951, in Bismarck, North Dakota. John J. Keller died on February 8, 1913, in Butte, Montana. Ferdinand Klawitter, a private in B Company who was on detached service at the time of the battle, died on May 17, 1924, in Nax, North Dakota. John Lattman, a private in G Company who participated in the valley and hilltop fights, died on October 7, 1913, in Rapid City, South Dakota. He was buried in Elk Vale Cemetery which is east of Piedmont, South Dakota. Little Sioux, an Indian scout who was with Reno’s column in the valley fight, died on August 31, 1933, in North Dakota. John J. Mahoney, a private in C Company who was with the pack train and in the hilltop fight, died on July 27, 1918, in Sturgis, South Dakota and was buried at St. Aloysius Cemetery in Sturgis. Samuel J. McCormick, a private in G Company who was in the valley and hilltop fights, died on September 10, 1908, in Fort Meade, South Dakota. He was buried in Bear Butte Cemetery in Sturgis, South Dakota. Thomas F. McLaughlin, a sergeant in H Company who was wounded in the hilltop fight, died on March 3, 1886, in Jamestown, North Dakota. Jan Moller, who was also known as James Moller, was a private in H Company who was wounded in the hilltop fight. He died on February 23, 1928, in Deadwood, South Dakota, and was buried there in the Mount Moriah Cemetery. Lansing A. Moore died on July 27, 1931, in Rawlins, Wyoming. William O’Mann, a private in D Company who was in the hilltop fight, died on April 26, 1901, in Fargo, North Dakota. Daniel Newell, a private in M Company who participated in the valley and hilltop fights and was wounded, died on September 23, 1933, in Hot Springs, South Dakota. He was buried in Bear Butte Cemetery in Sturgis, South Dakota. John Pahl, a sergeant in H Company who was wounded in the hilltop fight, died on January 28, 1924, in Hot Springs, South Dakota and was buried in Bear Butte Cemetery in Sturgis, South Dakota. James Pym died on November 29, 1893, in Miles City, Montana. Michael Reagan, who was not at the battle, died in 1917, in Columbia Falls, Montana. Red Bear, who was also known as Good Elk, was an Indian scout who was in the valley fight. He died on May 7, 1934, in Nishu, North Dakota. William Sadler, a private in D Company who was on detached service at the time of the battle, died on November 12, 1921, in Bismarck, North Dakota. Hiram Wallace Sager may have homesteaded in the Black Hills of South Dakota in 1887. See http://ftp.rootsweb.com/pub/usgenweb/sd/campbell/land/camp-st.txt. James W. Severs died about 1912 in Rock Springs, Wyoming. Walter Scott Sterland, a private in M Company who was on detached service at the time of the battle, died on August 27, 1922, in Bismarck, North Dakota. Strikes the Bear, an Indian scout who crossed the river with Reno’s Column, died on June 7, 1929, in Ree, North Dakota. Strikes Two, an Indian scout who crossed the river with Reno’s Column, died on September 8, 1922, in Elbowood, North Dakota. Peter Thompson, a private in C Company who was wounded in the hilltop fight and later awarded the Medal of Honor, died on December 3, 1928, in Hot Springs, South Dakota. He was buried in the Masonic Section of the West Cemetery in Lead, South Dakota. James Weeks died on August 26, 1877, on the Crow Agency in Montana Territory. Henry Charles Weihe, who was also known as Charles White, was a sergeant in M Company who fought in the valley and hilltop fights and was wounded. He died on October 23, 1906, in Fort Meade, South Dakota, and was buried in the Old Post Cemetery at Fort Meade. John S. Wells, a sergeant in E Company who was on detached service at the time of the battle, died on July 16, 1932, in Dickinson, North Dakota. Adam Wetzel died on March 20, 1909, in Bozeman, Montana. White Man Runs Him died on June 2, 1929, in Lodge Grass, Montana, and is buried at the Custer Battlefield National Cemetery on the Crow Agency, Montana. White Swan died on August 12, 1904, on the Crow Agency, Montana. Felix Villiet Vinatiere, the Seventh Cavalry’s Chief Musician, was not present at the battle. He died on December 15, 1891, in Yankton, South Dakota. Charles A. Windolph died on March 11, 1950, in Lead, South Dakota. He is buried in the Black Hills National Cemetery in Sturgis, South Dakota. James Wynn, a private in D Company who was in the hilltop fight, died on March 21, 1892, in Fort Yates, North Dakota. Younghawk, an Indian scout who participated in the valley and hilltop fights, died on January 16, 1915, in Elbowood, North Dakota. The geography now South Dakota, in 1874, was an empty, blank space on the maps. The highway into this unknown territory was the Missouri River. The post Civil War U.S. Army had troops in camps along the river. Fort Union was one of the major Army forts and was walled with “drive up” windows and a room for trading furs with the Indians. Security dictated Indians not be in direct contact with troops and families inside the fort. The fort in 1874 was commanded by General William Hazen, George Armstrong Custer’s nemesis clear back to West Point when Captain Hazen ordered Custer court-martialed. The fort was where the Yellowstone and Missouri rivers join and run south together. Southwest of present South Dakota, the Army bought a trading post that became Fort Laramie. Its mission was to supply, rest, repair, and protect the thousands of wagons and people traveling on the Oregon and Mormon Trail. Population in the United States was exploding and everyone with influence in the Territory wanted the Army involved in protection from Indians. A series of treaties with Indian bands was needed to allow railroads, telegraph lines, roads, and trails to gold rushes to California and Montana, and to the coal mining needed to supply the Transcontinental Railroad and homesteaders moving West up to the 100th meridian. People were moving into blank spots on the map seeking the dream of owning land. What was later labeled “The Great American Desert“, after a generation of starvation, was just on the west side of the Missouri River. General Phil Sheridan was the driving force behind organizing a massive expedition into this territory in western South Dakota, explore and prepare a map and report on the country around Bear Butte. Sheridan was anxious to have a military post to control the Indians who were not agreeing to go onto a reservation. (2) Crazy Horse was one of those leaders who would not quit the freedom he had always lived. Sheridan sold President Grant on letting him use the 7th Calvary, stationed at Fort Abraham Lincoln at present day Mandan, North Dakota, for the exploration. Across the river at Bismarck was the end of the rail and telegraph lines. Sheridan had the option to use the railroad and Fort Laramie troops but he did not want to stir up the Indians in the area from Fort Laramie to the Black Hills. There were reporters from Chicago and New York on the trip and many other population centers. The 1874 exploration in the wilderness is memorialized in modern maps of South Dakota. 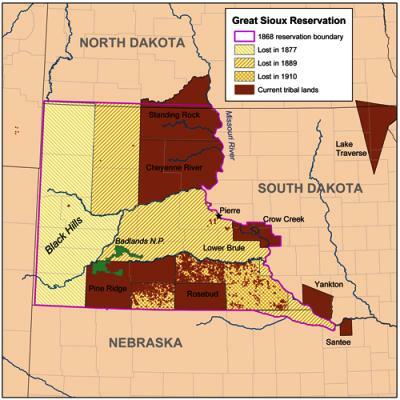 There are over forty-nine map locations: Ludlow, SD (Chief Engineer on the trip); Tilford, SD (Commander of Fort Rice and head of infantry on the trip), Custer peak, and even “Turk head” rock (after one of the hunting hounds the General brought along) because of the exploration. Scott Nelson, Pierre, SD (3), is making a serious effort to find and photograph the grave sites of members of the 7th Calvary buried in South Dakota. Many were on the 1874 exploration and others enlisted after the trip and were in the Battle of the Little Bighorn in June 1876. Some served in building Fort Meade in 1877. The army base was located by Sheridan when public pressure arose from the massive numbers of people seeking fortune in the Black Hills due to the reports of gold from the 1874 expedition. Locating the graves of the 7th Calvary veterans in South Dakota is a challenge. Joseph Bates is an example. Soldiers of the time may or may not have used their given name and often used different names when they enlisted or re-enlisted. Ernest C. Gottschalk, 97, was the one who attached the metal plaque to the headstone. The inscription “ECG -97” stands for Ernest C. Gottschalk and 97 is the year he placed the plaque on the tombstone (1997). Before it was engraved by Gottschalk, the silver plaques were the standard marker used to identify grave sites before a headstone was placed in the cemetery. From 1986 Gottschalk, who lived at Vale, S.D., made a project of finding grave sites in many counties in the northwestern part of the state that were no longer marked. He kept records of the graves he found and re-marked them. He filed his findings with county offices in Lawrence, Meade, Butte, Harding, and Ziebach counties, which have booklets of information listing his findings by cemetery (6). Ernie Gottschalk was given a Certificate of Recognition from the South Dakota State Historical Society Board of Trustees in December 1993 “for documenting burial sites.” These certificates are given out from time to time for meritorious acts in the history field. Gottschalk depended heavily on pioneer papers of the area, most of which are only available on microfilm in local libraries. Gottschalk died in 1997. On the west end of Sherman Street in Sturgis is the Catholic St. Aloysius cemetery. It’s about three miles straight west from Bear Butte cemetery. Joseph Bates has the only military marker in one section of the Catholic cemetery. He was a survivor of the Battle of the Little Bighorn valley and the hilltop fights. “Joe Bates is dead. And the verdict of the coroner’s jury is ….he took Paris green with suicidal intent. No blame is attached to anybody, as Bates repeatedly said he was all right, and wouldn’t have a doctor. The coroner’s jury decided he died by his own hand. Bates service records listed him as Joseph C. Murphy in L, 1st Massachusetts Calvary in 1863 rising to the rank of 1st Sergeant. After the Civil war he re-enlisted as Joseph Bates and was assigned to the 7th Calvary. He may have suffered from shell shock/combat fatigue. In those days alcohol or addiction to morphine was the only way soldiers could deal with this problem. Many soldiers were sent to insane asylums or committed suicide. Bates’ long military service and memories of action at Little Bighorn with Company M may have been too much for him. (9 & 10) He was discharged in 1877 after the post surgeon at Fort Rice, Dakota Territory, issued his report. This research is presented with the hope someone has information that will answer questions that still remain. 1. People who have not read the Treaty of 1868 still claim it says “so long as grass grows and water flows.” No agreement with Indians – or Treaty – during Presidents Grants eight year administration has any such language or guarantee. 2. President Grants’ policies for Indians of the time; a. Sanctuaries (Reservations) b. annuities and c. re-location. d. Peace e. time lines. 4. Section 2, lot 43, Bear Butte Cemetery. The GAR was active in providing financial assistance to veterans with no family and no money. 6. Angela M. Ross, Meade County Register of Deeds, Sturgis, S.D. – E. Mail – mcrod@meadecounty.org – keeps on file in her office the material Gottschalk filed with Meade County by cemetery of graves he found and marked with these plaques. Ross reports Gottschalk filed with many counties information specific to the county where he filed the report. He also did some marking of graves in Wyoming. The legality of marking 300 graves and changing markings on headstones with aliases used by veterans, based on obituaries published, for over 10 years is an open question. 11. The NPS Soldiers and Sailors web site lists Joseph c. Murphy. It lists two John Murphy’s in the 1st Mass. Calvary. Jack McCulloh, Larry Owen, and Joe Sanders all of Rapid City started tracking as a hobby and a way of hiking in the Hills every week including skiing Terry Peak. the Custer Trail in the Black Hills with a GPS in 1994. After the publication of this research McCulloh started guiding groups to sites visited by the 1874 Exploration and conducting community education classes on the 1874 expedition. Scott Nelson describes himself as a Custer buff.